Coming with us to Bali or Costa Rica? If you’ve never surfed in warm water before, you’re in for a treat. The water temperature in both destinations is normally a toasty 27-30c so you don’t need a wetsuit, happy days! Surfing in a bikini is the dream, but if you’re shopping for a bikini to surf in, look for something that’s likely to stay put in a wipe out. Choose tight fitting bottoms over a looser fit, some people like to go one size smaller so they’re still tight when wet. You can also find some brands with tie up strings to keep them in place. When it comes to tops, cross backs can help keep things secure, and high necks are also a good bet for preventing fall out! From left to right: Sweaty Betty, Kobe Surf, Akela at Seafoam. 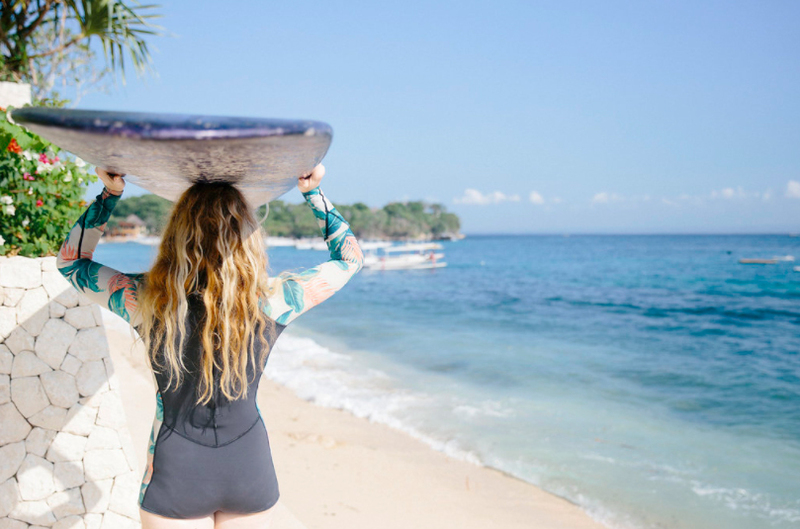 Although surfing in a bikini is great, rash vests are a godsend for surf sessions in stronger sun, when you’re suffering from rub from your board/wax or if you just find surfing in a bikini too perilous! We always recommend bringing a cover up of some kind as well as a bikini. There are loads of short sleeved, sleeveless and long-sleeved versions to choose from. From left to right: The Hidden Way, Rip Curl, Seea. One pieces are really good for surfing in as they stay put and look super stylish to boot. They offer a bit more coverage than a bikini, especially for the stomach which can be prone to the dreaded surf rash. From left to right: Sea Folly, Mona Beach Life, Dkoko. These surf specific suits combine the best bits of a one piece and a long-sleeved rash vest – they protect you from the sun and from losing your outfit! From left to right: Seea, O’Neill, Roxy. Board shorts are super for a bit of extra coverage/sun protection. Again, the surf-specific ones often have a tie to keep them where they should be during duck dives and wipeouts. From left to right: Odina at Seafoam, Volcom, Hurley. 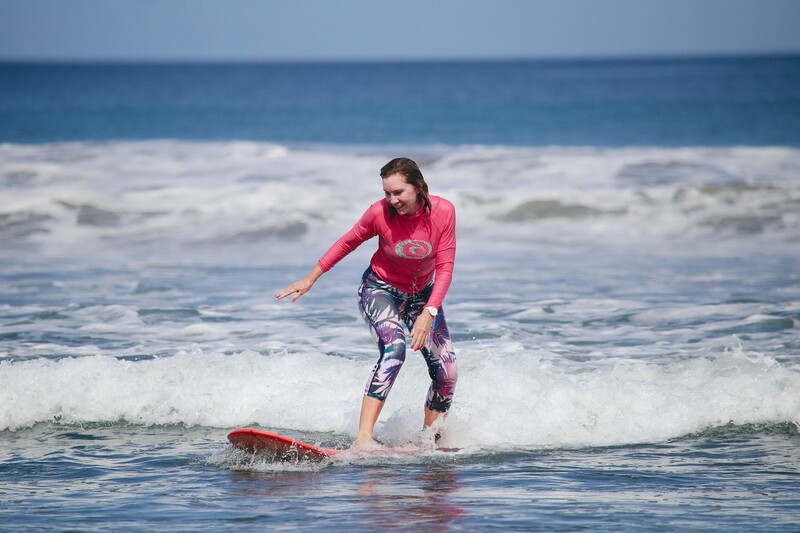 Surf leggings are an awesome for protecting against sunburn on the backs of your legs and also to protect from rub. Look for lyrca (not neoprene) ones for the tropics. From left to right: Sensi Graves, Salt Gypsy, Roxy. For more leggings see our dedicated surf leggings blog! Although you don’t often need neoprene in the tropics, there can be the occasional chilly morning where a bit of extra warmth might be appreciated. They also offer a little extra protection against bangs and bumps that your wetsuit normally cushions you from at home. From left to right: Billabong, Kassia Surf, Billabong.